Type 1: You know it's fun while you're doing it. Type 2: Doesn't seem like fun at the time, but when you look back you realize it was indeed fun. I recently completed The Big Guns 1016K permanent from Portland, OR to Whitefish, MT with two women (Asta and Susan) from Oregon Randonneurs and two guys (Doug and Paul) from Desert River Randonneurs. Doug had to bail out in Kellogg, ID due to excruciating IT band pain. The remaining four of us finished the ride "hors delai" (we exceeded the specified time limits). I can't speak for Doug, but for the rest of us the above relation definitely holds true. Day 1: Portland, OR to Walla Walla, WA. 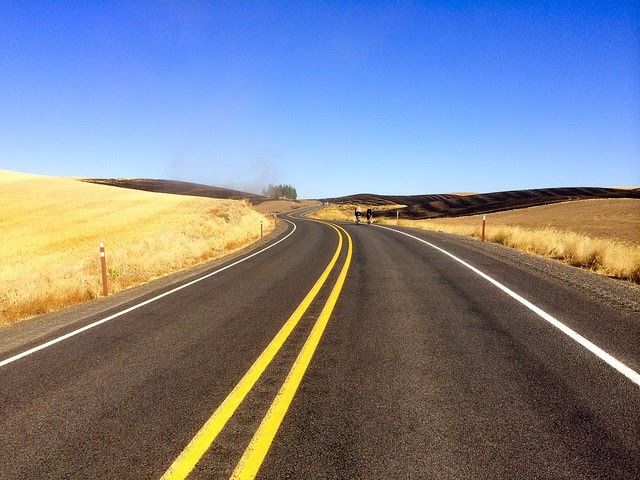 Day 2: Walla Walla, WA to Kellogg, ID. 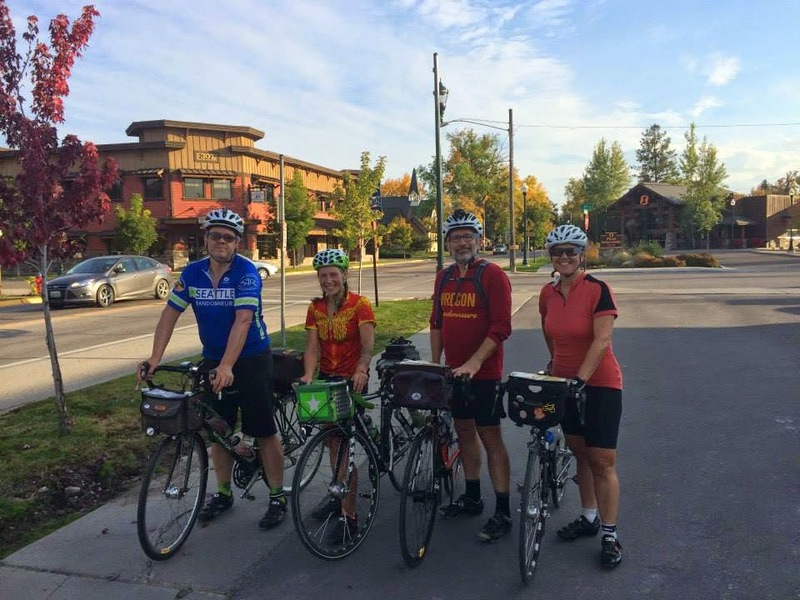 Day 3: Kellogg, ID to Whitefish, MT. We had hotel reservations in Walla Walla, Kellogg, and Whitefish, plus Amtrak reservations for the trip home. In addition, I had an Amtrak reservation from Seattle to Portland, plus a rental car in Whitefish. My wife Kasia had an Alaska Airlines Seattle-to-Whitefish reservation so she could meet us at the finish. We planned to play tourist in Glacier National Park. 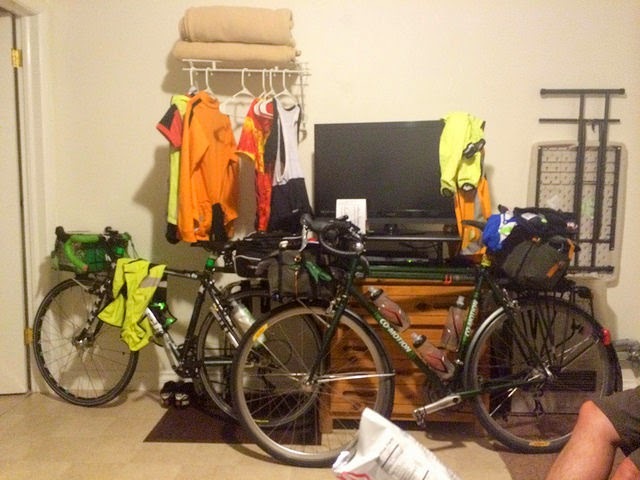 Susan, a self-proclaimed bike diva, mailed clean bike kit and snacks to the two intermediate overnights, rather than carrying everything with her. I embraced my inner diva and did the same. It was comforting to know that everything I needed for the next day would be waiting for me at the hotel. As they say, "the best laid plans of mice and men often go awry", and awry they went. The first day could not have gone better. Most of us (all except Asta) met at Bridgeport Brewing Company for pre-ride dinner. After filling our bellies, we slowly trundled over to Voodoo Doughnuts Too, our official start. After photos and donuts, we rolled out of the parking lot a little after 8:00pm. It took us a little over an hour to get out of Portland and join the Historic Columbia River Highway. I'm sure the scenery was gorgeous, but there wasn't much to see in the dark. On the other hand, there wasn't much traffic at that hour, so that's a definite plus. We reached Vista House a little over two hours into the ride, at which point it started raining. It was only a light sprinkle, and lasted for less than hour. This was the only rain we saw on the entire ride -- not bad for a mid-September ride in the Pacific NorthWET. 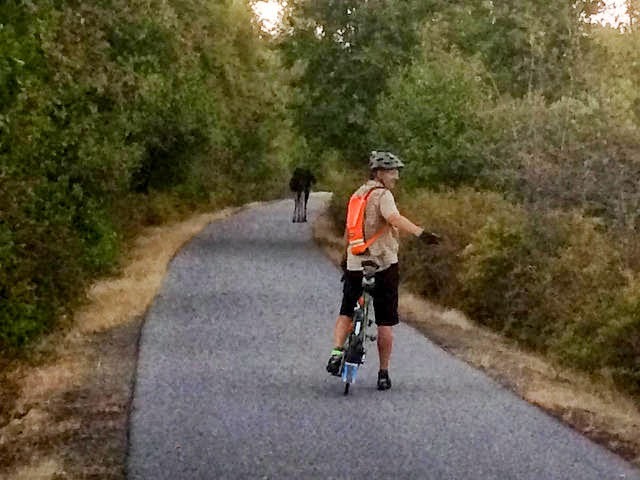 Three hours into the ride we joined the Historic Columbia River Highway State Trail, a paved multi-use path. It was dark, heavily wooded, and a little spooky -- a perfect place for a late night ride. Eventually we rejoined the normal roads and crossed the Bridge of the Gods over the Columbia River. Back in Washington! 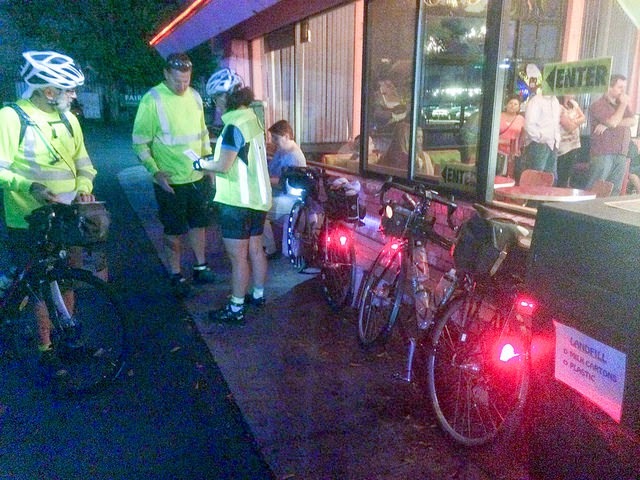 Shortly after crossing, we stopped in Stevenson to refill water bottles and grab a little caffeine. Asta seized the opportunity for a quick nap. The remainder of the day was mostly uneventful. 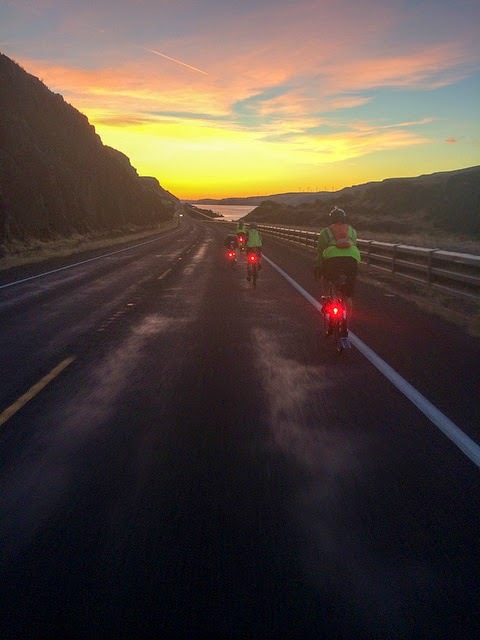 A very helpful tailwind pushed us through the Columbia River Gorge all the way to Walla Walla. We arrived with about 9 hours in the bank. We originally planned a 00:15 departure. Susan pushed for an earlier departure to protect our time in the bank, and perhaps even build a little more. After a bit of "negotiating", we all agreed on midnight. That is, until Doug discovered his flat tire in the morning. He apparently ran over something (likely glass) that went unnoticed, and the tire slowly deflated in his hotel room. After he made the necessary repair, we rolled out of the hotel parking lot at... 00:15. This was a brutal day in the saddle. We knew to expect 8000+ feet of elevation gain for the day. We also knew to expect 198 miles for the day. Those two figures together are actually not that bad, but they fail to tell the whole story. The final 50 miles or so for the day were along the very flat Trail of the Coeur d'Alenes, so we really expected 8000+ feet of elevation gain in the first 150 miles of the day. Still not horrible, but add in the morning cold, the afternoon heat, and a relentless headwind, and you have a recipe for a long, hard day of riding. Get to the bottom of a climb. Stop, peel off a few layers, start climbing. Get to the top of the climb. Stop, put everything back on, start descending. It was clear early in the day that Paul was not doing well. He had been experimenting with a low carbohydrate diet -- this worked OK on day 1, but started to fall apart by day 2. We all stopped in Colfax, WA around 11:15 for much needed "real food" at a local cafe. Even this didn't give Paul the necessary recharge. Somewhere around Oakesdale (IIRC) we decided to split up. Susan, Doug and I would proceed ahead, while Asta hung back with Paul. It was around this time that Doug mentioned a developing knee issue. The good news: it wasn't his knee joint. The bad news: it was his IT band, an issue that can only be fully resolved by time off the bike. 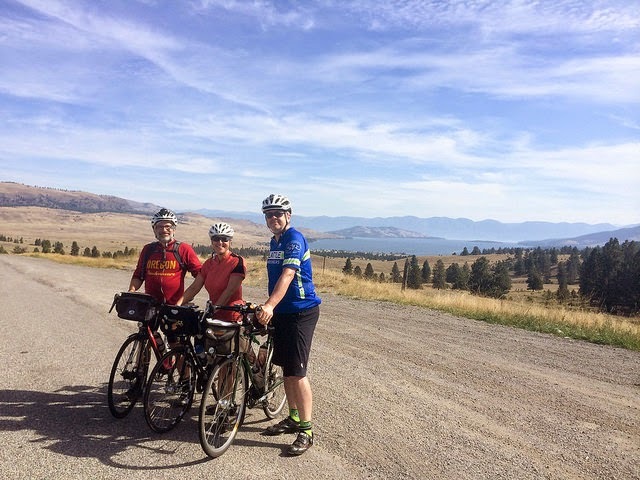 Susan, Doug and I rolled into Plummer, ID around 17:15, inhaled burgers and shakes at a Zip's Drive In, then joined the Trail of the Coeur d'Alenes. We really wanted to ride the entire trail in daylight, but our slower than expected pace meant we only saw about half of it. 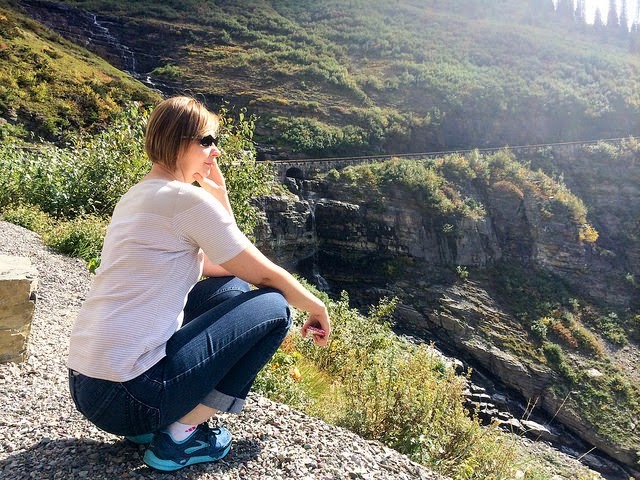 The scenery was beautiful, and we saw a fair amount of wildlife (including a moose on the trail, and several off trail). About 90 minutes after leaving Plummer, Susan got a text message from Asta: they were just rolling into town. The last few miles of the trail seemed endless. I thought we'd never actually roll into Kellogg, but we did, around 21:15. We planned a 01:00 departure, which would give us about 24 hours to ride the final 190 miles to Whitefish, MT. By the time I ate dinner (yogurt, bananas, granola, and Cran-Apple juice from a nearby grocery store that was thankfully still open), showered, prepared the bike for the next day's ride, and called my wife Kasia for a quick update, I was looking at maybe 90 minutes of sleep. Not good. me: Hey Susan, what's up? Susan: I'm in room 3; stop by when you're ready to go. If I had not been so exhausted and sleep-deprived, the conversation would have raised red flags. In retrospect, it was an odd conversation to have 15 minutes before departure. I finished preparing and walked my bike across the parking lot to room 3. The door was slightly ajar, so I just walked in. Asta was there, sitting on the floor, and looking like a total wreck. Susan was also there, bouncing off the walls like an ADHD gerbil on amphetamines. Asta and Paul had just arrived a few minutes before. They had not yet had time to eat or shower, much less sleep. They were in no condition to proceed. Susan had mistakenly taken a caffeine pill before going to bed. She intended to take an antihistamine, but in her mental fog, grabbed caffeine instead. She managed to get about 15 minutes sleep before the caffeine kicked in and woke her. She was also in no condition to proceed. Doug: DNF due to IT band issues. Paul: DNF due to energy/metabolism issues and lack of sleep & time. Asta: DNF due to lack of sleep & time. 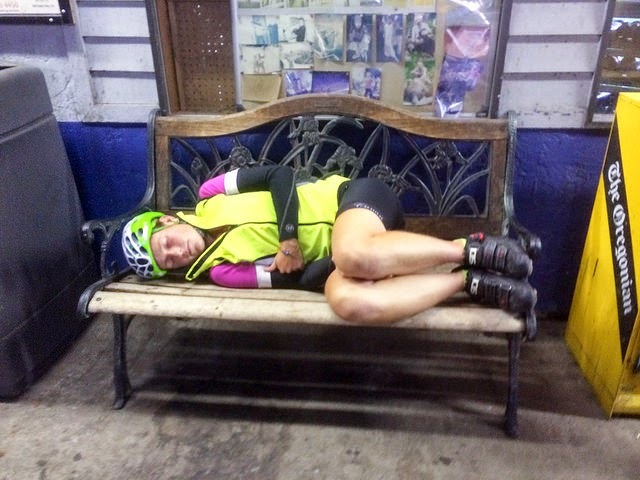 Susan: DNF due to lack of sleep & time. I should probably add myself to the "DNF due to lack of sleep & time" list, but -- at first -- I was willing to proceed. That is, until I learned I would be riding the final leg alone. The thought of a solo, sleep-deprived, freezing-cold, pre-dawn climb up Thomson Pass, with absolutely zero services for the next 68 miles was not exactly appealing. Wallowing in my own mental fog, I was undecided on how to proceed. Go for it? DNF? If DNF, then what? We still needed to get to Whitefish. I called Kasia and described the situation. Her first words: "Please don't do this alone." This brought me back to reality and provided some clarity. To ride this next route solo would be stupid and dangerous. Deep down I knew this, but I needed to hear Kasia's words. In my mind, the ride was "over", so Kasia & I discussed what to do next: cancel her flight to Whitefish, cancel the hotel, cancel the rental car, I'd ride the train back to Seattle solo, etc. We all go back to bed and sleep until 08:00. Thankfully, I had not yet turned in my room key. We wake up, prepare for the ride, checkout of the hotel, and get a big breakfast before departing. New goal for day 3: Plains, MT, about 94 miles away. Spend the night in a hotel in Plains. 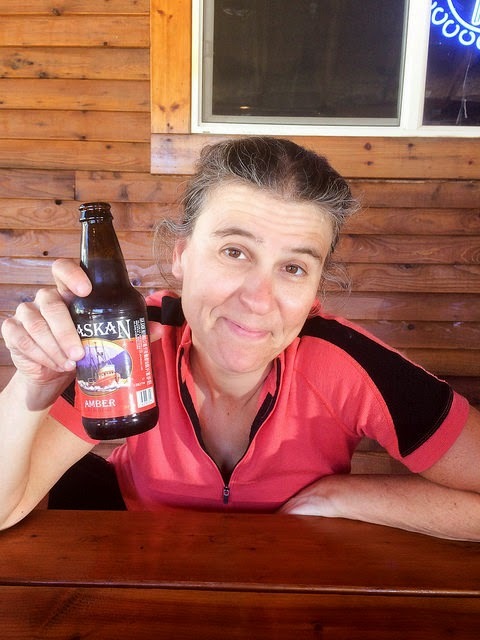 Finish the ride to Whitefish (~99 miles) the day after. We all DNF the permanent, but we finish the ride (all except Doug). I called Kasia and gave her the updated plan. She suggested that we not cancel her flight or the rental car, and that she fly to Whitefish as planned. Why not? She would beat us to town by 18 hours or so, but she'd have time to sleep late, explore the area, and provide beer & snacks at the finish. Perfect! The extra 6 hours sleep and hearty breakfast did wonders for Paul. He seemed fully "back", as if day 2 had never happened. The route backtracked along the trail, then joined Coeur d'Alene River Road. 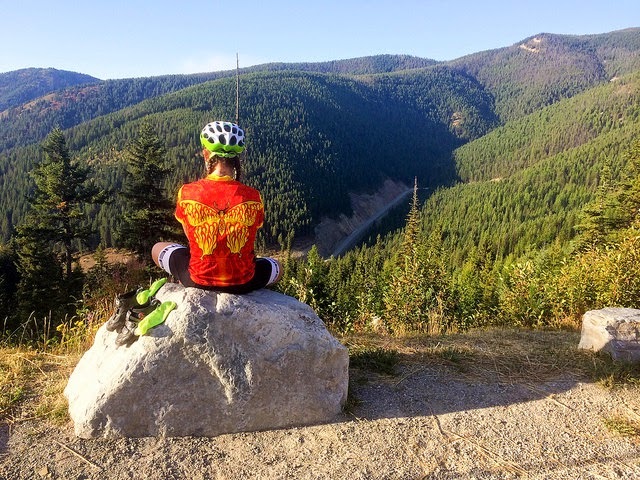 It was flat, beautiful ride along the Coeur d'Alene River. We stopped in the tiny town of Murray, ID for water, beer, and french fries at a local biker bar. After Murray the road began to climb in earnest. It was slow going for all of us, except Asta of course. She's a climbing machine, and beat us to the summit by about 30 minutes. After pausing at the summit to catch our breath and take the requisite photos, we enjoyed an awesome screaming descent to Thompson Falls, MT. The final 25 miles or so from Thompson Falls to Plains was peaceful with little traffic (we probably saw more deer than cars along this stretch). We rolled into the Dew Duck Inn around 21:30 where we checked into the only remaining room. The room had three beds (including a bunk bed), a hot shower, a fridge, and was rando heaven. Reasonable people would go straight to sleep, but then again, reasonable people probably would not attempt such a ride in the first place. We sat around, ate our food, drank a few beers, told stories, and laughed ourselves silly until about 01:00. Before falling asleep, I received messages from Kasia that she had safely arrived at the hotel in Whitefish. I cannot even begin to express how comforting it was to know she would be waiting for us at the finish. 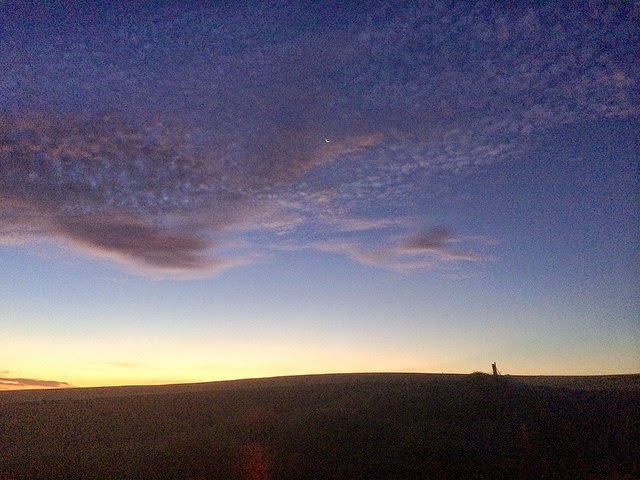 It was a perfect end to an awesome zero-pressure day of riding. Up at 06:30, out the door at 07:00, breakfast, roll at 08:00, average 10MPH for the day, reach the hotel in Whitefish by 18:00. Piece-o-cake. That was the plan. We rolled out individually, first Susan, then me, Paul, and finally Asta. I rolled at 08:05, not bad considering how much we'd ridden the previous 3 days. The day started with a fairly nasty climb: 1100 feet in the first 5.5 miles. It was tough, but it meant we competed ~20% of the day's climbing in ~5% of the day's distance. I always love front-loading a day's climbing. After about 47 miles (and about 4.5 hours) we reached the lovely Flathead Lake. After a huckleberry shake break in Rollins, and lunch (and more ice cream) in Lakeside, we joined the Great Northern Historical Trail a paved (and mercifully flat) multi-use path. This beautiful path took us most of the way to Kalispell, MT. A little zigging and zagging through Kalispell put us onto Whitefish Stage Road. 14 miles later, we arrived in Whitefish. The original plan had Susan, Asta, and Paul taking the 22:46 Amtrak home on Monday evening. This was the motivation go reach the hotel by 18:00 -- so they could shower, eat, and prepare for the trip. Kasia & I planned to stay an extra day and depart at the same time on Tuesday evening. After a little bit of researching and phone calls, the other three extended theirs stays (hotel & train) until Tuesday. We all went out for a well-earned recovery dinner at the Great Northern Brewing Company. 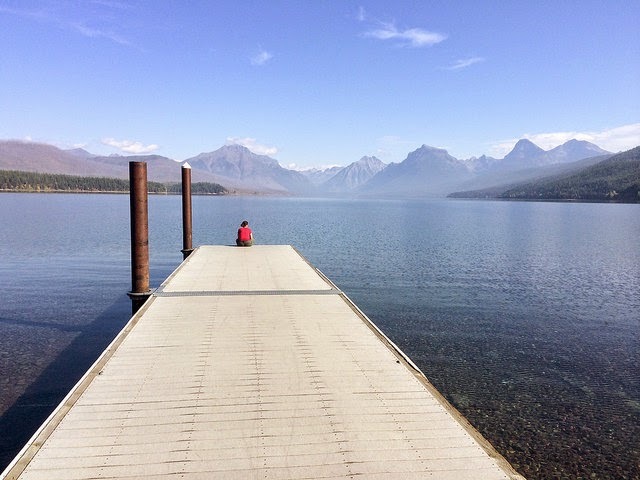 Tuesday morning, after a great breakfast at Loula's, we got a couple of rental cars and drove to Glacier National Park. It had been years since I visited the park last, and it was even more beautiful than I remember. We had all had a great time playing tourist. Back at the hotel, we polished off the drinks and snacks that Kasia had purchased before we arrived, headed to the train station, packed our bikes, and began the 14 hour ride home. We finished the Big Guns 1016K hors delai, so it doesn't count towards our RUSA results. Once we accepted that we were going to DNF, all time pressure was off. We had a wonderful two day ride from Kellogg to Whitefish. It was a great reminder that not all rides need to be "official"; sometimes it's good to just get on the bike and ride. My Big Guns 1016K Flickr album. Susan's ever-growing Big Guns 1016K Facebook album.